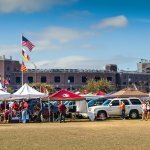 Five Summer Tailgating Safety Tips | Resmini Law, LLC. There is nothing better than the sunshine and the warm air that summertime brings along! This time of year can bring out the best in people, great food, and amazing music! Everything can go smoothly taking the right precautions, especially when it comes to tailgating concerts or sporting events. Here are five important tips to take into consideration before having a safe, successful, and fun time! If you plan on tailgating, most grillers will take a charcoal grill with them over one fueled by propane. Be sure the grill itself is cleaned from leftover coals and ash from its prior use. Also, when you go to fire it up at the tailgate, it is recommended to use instant light charcoal. It may cost a little extra, however, you do not need to use lighter fluid which can be a fire hazard! A day spent out in the sun laughing, singing, dancing, drinking, and eating can take a toll on your body. When alcohol is mixed into the equation, it is best to alternate between alcoholic beverages and water. This can ensure that your body is still taking in water while handling the rest of the activities your body is enduring. Whether it is a cloudy or sunny day, put the sunscreen on! Even if the sun isn’t shining through the clouds and you are outside all day long, you are still just as likely to get a sunburn as you would on a sunny day. Save yourself from lathering up in aloe and walking stiff because you got a sunburn. In New England, the weather can change like the flick of a light switch. One moment it is a beautiful sunny afternoon. The next, ominous thunderstorms roll through the area. It is good to inform yourself of the forecast before going out on a daylong tailgate. You can anticipate what weather is to come, be ready to put your equipment away and safely wait out the storm. This is one of the most important factors of tailgating. Selecting a designated driver can ensure that you will be getting to and from the event safely. So that it is fair all summer long, take turns between friends so everyone can still have a chance to have fun! For more summer safety tips, make sure to regularly follow our blog!